Pea shoots are the tender young sprouts of pea plants. 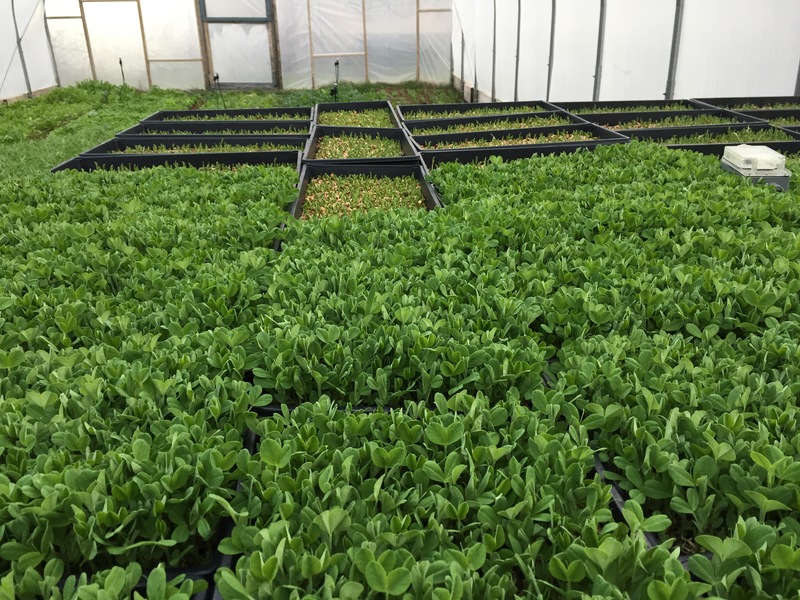 We grow pea shoots differently than other greens, in trays filled will a rich potting mix on benches in our greenhouse. In season: We currently only grow pea shoots for January, February and March, though they can be grown any time of the year. We grow them in this window because they are relatively quick to grow, allowing us to add something fresh and young to our winter offerings. Though pea shoots are cold hardy, they don’t do well when temperatures dip below freezing, so they are grown in our heated greenhouse. Shelf life: Plan to use pea shoots relatively soon after getting them. We cut fresh shoots when as dry as possible. If kept with as little moisture as possible and in plastic, pea shoots can last 5-7 days, but no more. Prep: Rinse and spin pea shoots right before using. Use: Use like fresh greens or sprouts: As a salad base, as a salad addition, on sandwiches, and as a garnish to soups. Pea shoots can also be sautéed or stir-fried. Grated roots on top of pea shoots: Grate fresh carrots, radishes, turnips, and anything else you like. Toss with sesame oil, a bit of sugar, and rice wine vinegar. Season with salt and pepper and serve on a bed of pea shoots. Pea Shoots with Beets and Avocado: Thinly slice a couple of roasted beets and some fresh red onion. Toss with a sweet and sour dressing made with balsamic vinegar, pomegranate molasses and olive oil. Toss gently with pea shoots, top with cubed, ripe avocado.